Whether it is Ratan Tata or any common man, at the end of the day, everyone needs a job. The only difference that remains is either you are self-employed, or you work under someone. But due to the uncontrolled growth of the population, thousands of people go unemployed everyday because there aren’t enough jobs available out there. Even poverty can be blamed to some extent as it contributes to illiteracy and thus, further increasing the rate of unemployed people in the country. This is because a candidate may not be educated enough to fit a certain job profile. But thanks, to our Indian government that it’s trying everything in its power to reduce the level of unemployment in the country. For instance, developing job websites from where candidates can apply for a government job and can even get updates and notifications about the same. Speaking of which, the state government of Gujarat has taken a great step in order to provide people with government job opportunities. After all, securing a government job in a country like India is ten times better than having a private job because of all the extra perks that a government job provides you. Gujarat which is a state located in the western part of the country is doing a great job by raising job opportunities for the unemployed people, especially the youth under both the state and the central government. 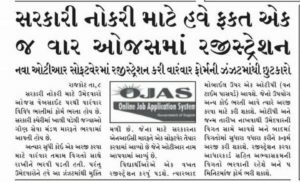 In order to provide adequate government job opportunities to suitable candidates, the government of Gujarat has developed a website named OJAS from where you can get notifications and updates about government jobs available in Gujarat. If you are unable to understand the concept of OJAS Online Jaherat then, let’s discuss it out vividly in this following content. Everyday a large number of candidates visit the website in the hope of getting a suitable government job for themselves. Because of which the amount of traffic the website can handle exceeds and therefore, the state government decided to open up a second version of the website with a changed look and domain name in the year 2016. However, many of the candidates are not aware of the change and thus, end up looking for jobs in ojas.guj.nic.in, and then, they are automatically redirected to the new website ojas.gujarat.gov.in. By this, one thing is certain that OJAS has been really a successful move taken by the Gujarat government. What is the registration date of Tat for higher secondary 2018 ?Please let me know. M.E computer Engineering gov job plz. where are you from? please yours adress concider to mail . adress related job requred now. Request to inform me for a government job in bank. Gov. job alerts according my eligibilty. Application to thay gay Pan photo ane signature upload nathi thata. Photo & Sign must be below 10kb size. Sachivalay and bin sachivalay ni bharti kyre aavse. Sachivlay And binsachivalay ni bharti kiyare aavese???? 1 thi 5 ni bharti Kyre thavani? ? ? ? ? ? ? ? ? ? ? Lower primary bharti kyare thavani? ? ? ? ? ? Sir, 1 thi 5 ni bharti Kyre thavani? ? ? ? ? ? ? ? Keep me updated for new examinations and advertisements. kindly pls. updated FHW GOVERNMENT EXAM. MSW WITH BSW COMPLETED plz goverment job and any online work plz informastion …. Tet 2 ni jaherat hve kyare aavse?